Find a therapist in Massachusetts with GoodTherapy.org. Massachusetts was populated by almost 6.8 million people in 2015, according to statistics from the United States Census Bureau. About 82.6% of residents were white, 6.6% were black, 6.3% were Asian, and 0.3% were American Indian or Alaskan Native. The Bureau of Labor Statistics suggests about 80,590 residents were employed in jobs that specialized in social or community service. These occupations included work as counselors at residential treatment centers, health educators, counselors at drug and alcohol rehab centers, guidance counselors, parole officers, counselors at correctional facilities, therapists at depression treatment centers, child psychologists, psychiatrists, religious workers, clinical social workers, and marriage and family therapists. In Massachusetts, these workers received an average annual salary of $45,610. After the mental health standards of all 50 states and the District of Columbia were evaluated by Mental Health America (MHA) in 2016, Massachusetts received an overall rank of 2nd, indicating a low percentage of mental health issues and a high percentage of access to mental health care for Massachusetts residents. MHA researchers posit Massachusetts’ high overall mental health rank correlates with low rates of toxic chemical release and low rates of obesity within the state. Among several major mental health categories, Massachusetts placed 2nd in adult ranking, 2nd in youth ranking, 15th in prevalence of adverse mental health conditions, and 2nd in access to professional care. 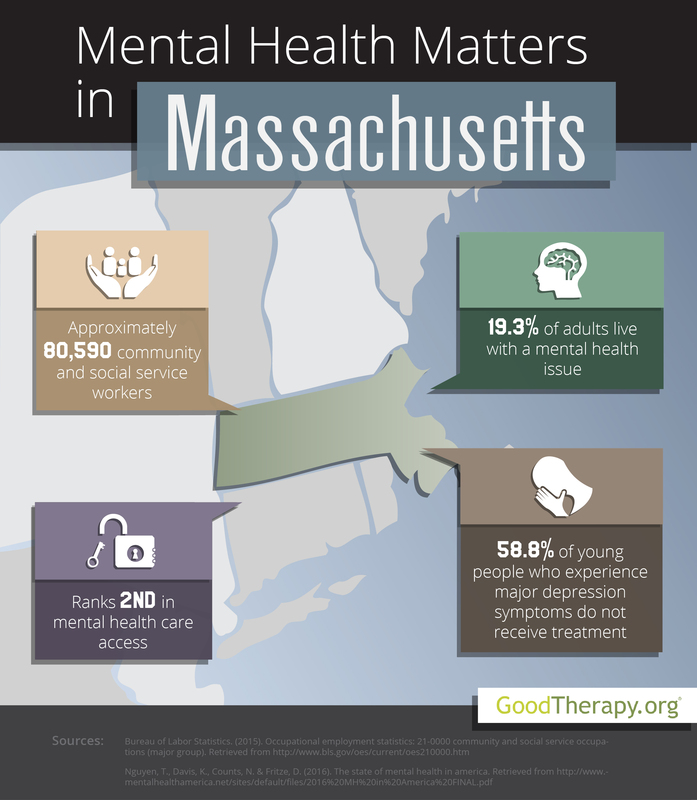 Though the state received high adult and youth rankings, therapists in Massachusetts do have several concerns about the mental and behavioral health of residents. For example, according to the 2016 MHA survey, 19.3% of adults are affected by at least one mental health issues, 9.2% of adults display dependence on alcohol and drugs, and 4% of adults have seriously contemplated suicide. Massachusetts was ranked 32nd, 33rd, and 32nd in these respective categories. A 2014 report from the Substance Abuse and Mental Health Services Administration (SAMHSA) claims that in 2012-2013, approximately 80.7% of adolescents in Massachusetts saw no great risk in smoking marijuana once per month; 65.8% saw no great risk in once or twice each week having five or more alcoholic drinks; and nearly 18% of young people under the legal drinking age engaged in binge drinking. The SAMHSA report states all three of these figures were higher than the national averages. While the data does indicate the presence of mental and emotional concerns among residents in Massachusetts, therapists and other mental health providers seem to be readily accessible for people in need of professional assistance. The 2016 MHA study states Massachusetts was 1st in the category of mental health workforce availability—with the ratio of residents to mental health providers estimated to be 216:1. The state was also ranked 4th for adults with mental health issues who did not receive treatment; 7th for adults with mental health issues who reported unmet need; 5th for adults with disabilities who could not receive treatment due to cost; 1st for adults with mental health issues who are uninsured; 7th for young people with severe depression symptoms who received consistent depression treatment; and 2nd for children with private insurance that did not cover mental health issues.